1) Marinate the chicken cubes with garlic paste, vinegar, salt and pepper for a few hours. 2) Take butter in a pan and saute the marinated chicken till it is cooked. Drain excess water if any. 3) Allow the chicken to cool. 4) Add mayonnaise and lettuce to the chicken. 5) Lightly warm a tortilla. 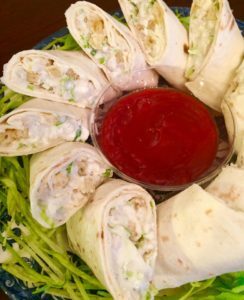 6) Spread little mayonnaise on the tortilla, add the filling with 3-4 french fries in each wrap and roll them. N.B – If not being served immediately, cover them with cling film to avoid dry rolls.